The system utilizes EdgeTech’s Full Spectrum CHIRP technology which provides high resolution imagery of the sub-bottom structure at penetration up to 100m. 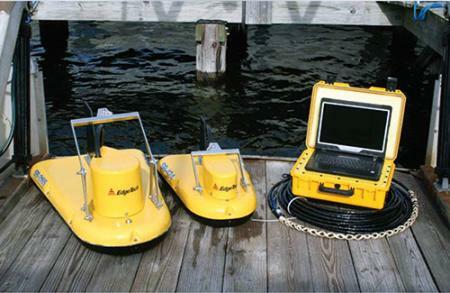 The 3100 is ideally suited for use in rivers, lakes, ponds and shallow water ocean applications up to 300m max depth. The system was designed for customers that require a portable system that can be used from smaller boats while not wanting to sacrifice image quality. A 3100 system comes with a choice of two towfish; either the SB-424 or SB-216S. These towfish operate at different frequency ranges and selection between the two depends on the type of application. The SB-424 operates at 4-24 kHz and will provide slightly higher resolution but less penetration. The SB-216S operates at 2-16 kHz and provides slightly less resolution but greater penetration. Along with a towfish, the 3100 system comes with a portable splash-proof topside processor with laptop computer running EdgeTech’s DISCOVER software for display of the sonar data. The system comes standard with a 35m tow cable with customer-specified lengths also available.